MARCOM's "Indoor Air Quality" Regulatory Compliance Kit™ shows employees the potentially harmful effects of poor air quality, and will help them prevent, identify and correct air quality problems. It is all around us, and we breathe it every day to stay alive. But how "clean" is the air that we breathe? While we know that it contains oxygen, hydrogen and nitrogen, there may be other substances in the air around us that we do not know about... such as dust, mites, spores, bacteria and hazardous fumes. Materials in the kit include a video program, five motivational posters, and 30 employee booklets. The posters in the kit remind employees of the importance of "healthy" air. 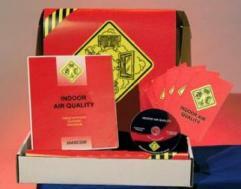 The videotape and employee booklets include information on the sources of air contamination, adhesive/solvent fumes and vehicle exhaust, how a building's occupants affect indoor air quality, the importance of proper housekeeping, smoking and secondhand smoke, the use of humidifiers and de-humidifiers, pollutant pathways, including air ducts and crawlspaces, heating and air conditioning systems, the signs and symptoms of poor air quality, and more. The video program in the kit comes with a comprehensive leader's guide, reproducible scheduling & attendance form, employee quiz, training certificate and training log.